The Beatles & Moody Blues: Why You are Here on Earth Part 1 - 10 Minutes of Brilliance: Smart, Funny, Creative and FREE! HARRIETT: Jack? He’ll be here. Just be patient. STAN: But it’s been over a month since Golberg published his last blog. Damn he’s slow. HARRIETT: Well, this was a particularly tough blog to write. After all, “Why YOU are here on Earth” is The Universal Question. STAN: I thought, “How did Kim Kardashian get so damn famous?” was the Universal Question. HARRIETT: That’s actually second. It’s right behind the question on man’s very existence, his being, his purpose in life. His raison-d’etre. STAN SCRATCHES HIS HEAD AND SQUINTS HIS EYES. STAN: OK, I didn’t understand that last thing. But then, I never took Spanish. Say Harriett, you got anything to eat? HARRIETT: Stan, you have the attention span of a tse-tse fly. STAN: Thank you, I think. Wait! I think Goldenberg’s here. Quick, am-scray. I don’t want him to catch us. Last time he said if he caught me wise-cracking on the blog one more time, he was gonna shut me up for good. HARRIETT: How did he say he’d do it? A poisoned dart? A staged accident? A knife through the heart? STAN: No, worse! Worse than anything you could imagine! He said he’d never type my name again. HARRIETT: Ouch! That could be painful. What a way to go! STAN: I know! Let’s go. I think I hear him thinking. STAN GRABS HARRIETT AND PULLS HER OFF THE BLOG. Hey Readers, sorry it took me so long so to write this blog. I was in pretty much over my head. This topic has proved to be unusually challenging, but also very popular. Over 300 new Readers signed up since I announced this blog would explain, well, the almost unexplainable. STAN YELLS SOMETHING FROM OFF BLOG. STAN: Hey man, cut the chit-chat. Let’s get on with the show. But enough chit-chat. Let’s get on with the show. STAN: Is he mocking me? Are YOU ready to find out WHY YOU’RE HERE ON EARTH? YOU are? You’re sure? YOU can handle it? OK, here goes, Reader. Oh, come on now! Did you really think I was going to tell YOU what your mission is here on Earth. Don’t YOU get it? That’s for YOU to figure out. Now I can give YOU some hints, but really, it’s your life, your game, you’re the player. Of course, there really is no YOU. No singular YOU, that is. There are many YOUs. I know YOU think there is ONE YOU. We all do. (Well, almost all of us.) That’s the Great Illusion. Well, one of the Great Illusions. 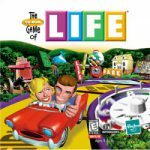 The “Game of Life” is not to be confused with The Game of Life. The former is a 4-6 player game, the latter is played solo. So here’s your first clue. You have to see through the Illusions. That’s part of the Game of Life. Well, part of the Game. Another Illusion is that we’re all separate. Now I know how stupid that sounds. Of course, we’re all separate! I’m me. You’re YOU. And everybody else is, well, somebody else. True, that’s the way it plays in the Material World. But guess what? The Material World isn’t the only World. It’s just one World, one plane of Reality. STAN: OK, I’m pretty sure Goldberg’s gone off the deep end, now. So, Harriett, I guess I am you, and you are me, and we are all together, huh? HARRIETT: That’s how the Beatles saw it. or rather sang it. STAN: Yeah and I am the Walrus! STAN SHAKES HIS HEAD IN DISBELIEF. STAN: Wow, what were the Beatles smokin’ when they came up with that. HARRIETT: Actually, Stan, that’s when the Beatles were looking for the meaning of Life. STAN: Hell, I’m still trying to figure out Parcheesie. HARRIETT: Do you want to learn something on go on being ignorant? STAN: Well, I’d like to do both. HARRIETT: All right, Stan, just pay attention. The Beatles were on top of the music charts and on top of the World. But it wasn’t enough. Because they understood there was a real meaning to existence and they wanted to know what it was. STAN: Are you sure you don’t have something to eat? A stick of Juicy Fruit. An old Oreo cookie? HARRIETT HAS DEALT WITH STAN ENOUGH TO KNOW THAT IT ISN’T EASY GETTING THROUGH TO HIM. STILL SHE TRIES AGAIN. HARRIETT: And the BEATLES weren’t the only ones who understood there was a Higher Reality. The Moody Blues also knew LIFE WAS A GAME. And they also knew we all were ONE. And life is just a simple game. And life is just a simple game. There has been evidence of a Higher Reality throughout history. But even if YOU believed that for a second, or a minute, the feeling wouldn’t last. YOU know why? Because there are many YOUs. And one of them will do everything in his power to make YOU forget THE QUEST. YOU think the world is outside YOU. It’s not. It certainly seems that way. And that screws up a lot in your Life. Sure, put your responsibility on the world outside YOU. Then YOU can’t be blamed when something goes wrong. Whatever went wrong wasn’t your fault, it wasn’t your responsibility. It was your parents’. Or society’s fault. And where does God figure into all this? Surely God should accept some of the responsibility. And yet we blame ourselves more than we can imagine. We all have so many fears. And we feel guilty. And that holds us back from doing what we want to do and being what we want to be. We think, mistakenly,we’re the only one who have fears and feelings of guilt and shame, but really everybody does. Take the classic example of bullies. They act like they’re strong and that they have power. But deep down they question their own worth and feel inadequate. Even though they’d never admit it. Now, you may not be a bully, but you probably question your worth, your value hundreds of times a day in that complex underused brain of yours. It may seem like other people’s troubles are less than yours, but that’s just because you’re just not in their heads experiencing what they experience. If you could go into a room filled with people and everyone hung all of their troubles and their worse nightmares on the wall, you would choose to have your own troubles rather than someone else’s. You’re blinded by another Great Illusion. YOU think God is something outside YOU, don’t YOU? 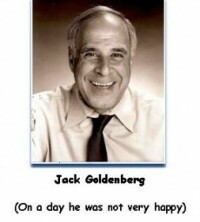 STAN: What did Goldberg mean by that? Do terrorists read this blog. HARRIETT: No, all Jack’s Readers are brilliant and good human beings. STAN: I read the blog. Well Readers, that’s it for now. This was only Part 1 of Why You Are Here on Earth. I will publish Part 2 tomorrow. Then, considering this is an important topic, there may be a Part 3 and 4. Who knows? If you’ve enjoyed this overly heavy topic, PLEASE let me know by leaving a comment on the blog. If not, and you’d rather that I concentrate on the funny side of life, leave a Comment that tells me that. And if you have absolutely nothing to say, then leave me a Comment and tell me that. STAN: That doesn’t make a lot of sense does it? If we don’t have anything to say, we should leave a COMMENT. HARRIETT: No it doesn’t make sense, but then again neither do you most of the time. STAN: Hey, that means I could write a blog. STAN: Yeah, but with my luck, Golberg would probably interrupt me like I do him. STAN: Who cares? Goodnight Harriett. HARRIETT: Good night Stan. See you tomorrow Readers. “I have absolutely nothing to say” but I was a Beatle fan! What’s got you so damned philosophical lately. The question of why we’re here was answered for me when I was a kid and arrived at summer camp and we all sang a song (not Beatles) that went like this…..
We’re here because ,,,,well you get the idea, we’re here because we’re here and if you need a deeper reason then try 42. Thank you Douglass Adams who by the way is no longer here. Now I’m really interested in seeing where the aliens, I mean gods, play into all of this! I’ll keep reading. The question of why we are here on Earth is fairly obvious, don’t ya think? Look around. Where else are we going to be and why would we even want to be anywhere else. Provided we don;t foul the whole place, we have all the air we can breathe, all the water we can drink and all the blogs we can read. The Earth is a most amazing place so I don’t think we should ask why are we here but how did we get here? The set of circumstances is so astounding that lately I am of the opinion that even if there are trillions of stars w/ planets in billions of galaxies, I still believe we are alone in this universe now. And NOW is the key. OK, Golberg I’m waiting to see where you’re going w/ this thing before I continue w/ Comment Part III. Hey Jack, Sorry I’m late; it looks like I’ve missed a lot of fun. I read once that before we are born we know who we are, and our lives are about remembering that. Going through life trying to remember who we are. If you do something and it feels bad, then you know…that’s not who you are, and you choose something different, and move on to the next discovery. I was working on a database once, and I was stuck on a problem. I went to bed thinking about my problem, and thinking to myself that I had to solve this, and find an answer. I didn’t have time to waste dwelling on it. In the morning, when I woke up, the first thought that popped in my head was “split the difference” Oh! Okay…. good idea, I’ll do that. And my problem was solved. The me inside of me gives me hints from time to time. It gives me pieces to puzzle to big question….”What am I doing here?” It knows the answer, and I’m beginning to put it together. For me it starts with me…. listening to myself. BTW…..I don’t think you’re in over your head….